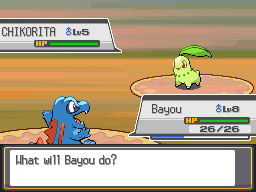 - I can only capture the first Pokemon that I encounter in each new area/route. - If a Pokemon faints, it is considered "dead" and must be released or boxed for the remainder of the playthrough. - All Pokemon must be nicknamed. 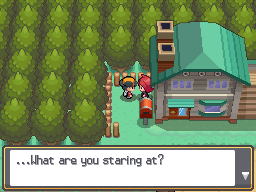 - Pokemon obtained as gifts from NPCs are allowed and count as the capture for the city they are obtained in. 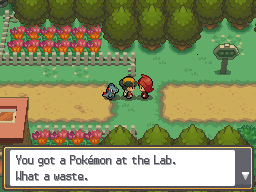 - Trades with NPCs are allowed, assuming that I actually have the Pokemon they're asking for. 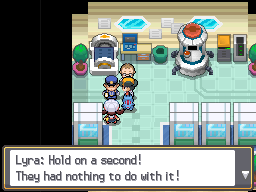 - Recovery items (excluding revives) may be used freely. 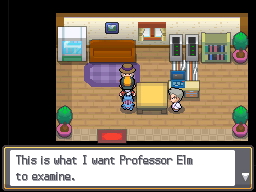 - Dupes Clause: in the event that my first encounter in a new area is a Pokemon that I've already caught (or is in the same evolutionary line as a Pokemon that I've already caught), I may choose to disregard that encounter and instead catch the next unique Pokemon that I encounter as my catch for that area. 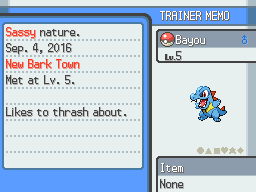 A new adventure begins! 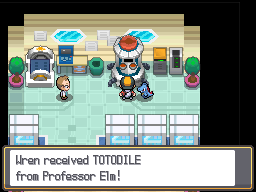 I’m summoned to the lab next door where I meet a suspicious (and very rude) red-haired boy, receive my first Pokemon (a Totodile named Bayou), and am sent on an errand by the professor. Many wild Pidgeys and a short tutorial later, I finally make it to Mr. Pokemon’s house where I’m presented with a mysterious egg. 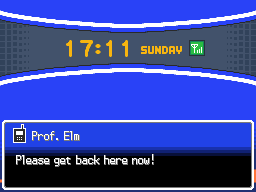 Not long after, however, I receive a frantic call from the professor ushering me back to the lab. 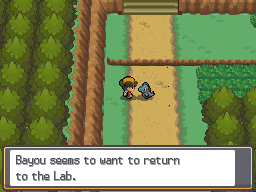 Even Bayou seems worried so I hurry back to the lab as fast as my running shoes will carry me! 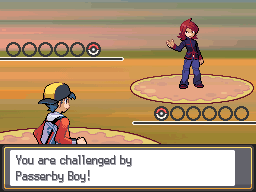 While rushing back to the lab I bump into a familiar red-haired boy who insults me before challenging me to a battle. 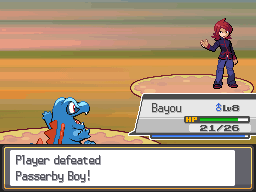 Bayou successfully wins his first battle against our rude new rival and I continue the trek back to the lab where a police officer jumps to conclusions and accuses me of a crime that I didn’t commit. 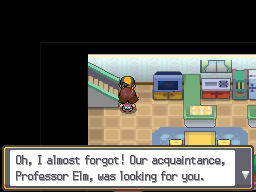 Thankfully my childhood friend Lyra defends my honor and with that little misunderstanding cleared up the police officer leaves to look for the red-headed thief, whose name we learn is “Kale”. The professor is briefly upset about the theft of one of his Pokemon but immediately cheers up when he sees Mr. Pokemon’s new discovery. How egg-citing! I look forward to more! 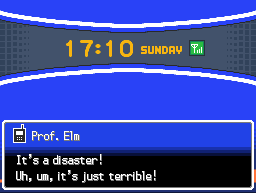 8D Good luck!